For over a decade, renowned banknote plate engraver and medalist Christian Gobrecht had been seeking a permanent position with the Mint. By the early 1800s, however, the nepotism permeating the Mint's employment practices was firmly entrenched. This engraver was that mint director's nephew, that official was another official's son, and so on. Professionally gifted as he was, but unrelated to any person-of-influence, Gobrecht unsuccessfully pursued the position of chief engraver. And ironically, he was without question, the best qualified for the job. One of seven children of a German immigrant minister, Gobrecht was born in 1785, in Hanover, Pennsylvania. Right away he showed a talent for mechanics and inventions. After apprenticing to a clock-maker, he moved to Philadelphia in 1811, and acclaim for his work as an engraver soon came to the attention of Mint Director Robert Patterson. Gobrecht at first declined Patterson's offer in 1817 to become Chief Engraver Robert Scot's assistant, but when Scot died in 1823, Gobrecht solicited President Monroe's endorsement for the vacant position. However, Chief Coiner Adam Eckfeldt (one of many Eckfeldts connected with U.S. coinage, both before and after this era) used his influence to see to the appointment of William Kneass, an engraver of lesser abilities, but whose studio was a gathering place for prominent Philadelphians. Finally, necessity won out over nepotism. In the summer of 1835, Kneass suffered a stroke and Gobrecht accepted the position of assistant engraver offered by Mint Director Robert Maskell Patterson's (brother-in-law of the previous director, Samuel Moore, and son of Moore's predecessor, Robert Patterson). Gobrecht started work immediately on the task of improving and updating the coinage. Patterson, concerned about artistic merit on the federal coinage and influenced by the seated goddess motifs of British designs, chose a drawing by Thomas Sully as the model for Gobrecht to bring to life on a new dollar coin. After the dollar patterns were released in December, 1836, the Mint's ongoing penchant for using the same design on all silver coins caused Gobrecht to begin work on the other denominations. Spending most of his time on his daily duties of die making for the current mintage, he used what little spare opportunities he had over the next several years to rework the designs for the smaller coins. It was not until the fall of 1838 that the new quarter replaced the old Capped Bust design of John Reich and William Kneass. On the obverse, Gobrecht used a modified version of his Liberty, seated on a rock and surrounded by thirteen stars, while the reverse had the Reich-Kneass eagle from the previous issue with the denomination as QUAR. DOL. instead of the earlier 25 C. In 1840, looking for an "improvement," Patterson hired artist Robert Ball Hughes to rework the design. Hughes added drapery at the elbow, and in general succeeded in fattening the figure of Liberty. Many felt the resulting rendition lacked the artistic merit of Gobrecht's original and, despite problems with flat striking, which did not exist with the 1838-39 coins, this version would remain for the rest of the series. Called the No Motto type because it lacked the motto IN GOD WE TRUST (added in 1866), over 36 million coins were minted of this variety between 1838 and 1853 and again from 1856 through 1865. It was struck at three Mints; Philadelphia (no mintmark), New Orleans (O) and San Francisco (S). The mintmark is on the reverse below the eagle. Mint records show that only 3,980 proofs of the type were made from 1859 onward, but proof examples from just about every year prior to then do exist, although they are exceedingly rare. The first issues, referred to as the No Drapery variety, most noticeably lacked a fold of drapery at Liberty's elbow. Issued only in 1838 and 1839 at Philadelphia and for part of the year 1840 at the New Orleans Mint, today this variety is scarce in all grades and very rare in mint state. At least one proof is purported to exist, possibly from among the twenty "specimens" sent by Patterson to Treasury Secretary Levi Woodbury in September, 1838. Robert Hughes's modified design issued from 1840 onward is replete with rare dates. The major rarity is the 1842 Small Date. Struck only in proof for inclusion in presentation sets for dignitaries, supposedly only six specimens exist. Other very rare dates include 1842-O Small Date, 1849-O and 1852-O. In mint state, almost all the dates prior to 1853 are extremely difficult to find. There are two reasons for this: First, the weak strikes of this era made many coins look more worn than they actually were; and second, the melting that took place around 1853 due to the increasing value of silver forever destroyed vast quantities of coins.Surprisingly, the low mintage 1853 Without Arrows, which is very scarce in all grades due to meltings, exists in Superb Gem Uncirculated to the tune of at least several pieces. Among the later dates, the toughest to find in mint state are the San Francisco coins from 1856-1865 and, to a lesser extent, the Philadelphia coins of 1863-1865. When pursuing gem specimens, type collectors will most often encounter the Philadelphia issues of 1857, 1858, 1861 and 1862. Although most collectors approach the Seated Liberty quarter series from a type perspective and desire to acquire only one of each variety, there are still some who find the challenge of completing a date and mintmark collection compelling. When grading this design, the high points on the obverse to check for wear are Liberty's knee, hair and breast. On the reverse, the areas to first show wear are the eagle's neck, claws and the tops of the wings. Care must be taken to differentiate between weak striking and wear, as many coins, particularly those up through 1858, are very weakly struck. By 1853, due to the increase in silver prices relative to gold, the silver in the No Motto quarters was worth more than face value. This led to their rapid disappearance from the channels of commerce. Accordingly, Mint Director George Eckert persuaded Congress to reduce the weight of silver coins to preclude melting. 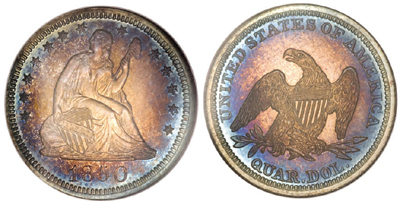 This set the stage for the next type of Seated Liberty quarter, the Arrows and Rays variety. The No Motto type without arrowheads or rays would not return until 1856.